Ever since Force Works, everything Dan Abnett's writing has set my senses ringing like a Bat-cave full of Bat-phones (or whatever the Marvel equivalent is). Now he's adding Galactus and the mohawked 'superman' himself, Gladiator, to the debut arc of the original Guardians of the Galaxy series. Oh yeah, it has an Alex Ross cover. One of them never hurts either. New Ongoing Series/Spider-Verse Tie-In! 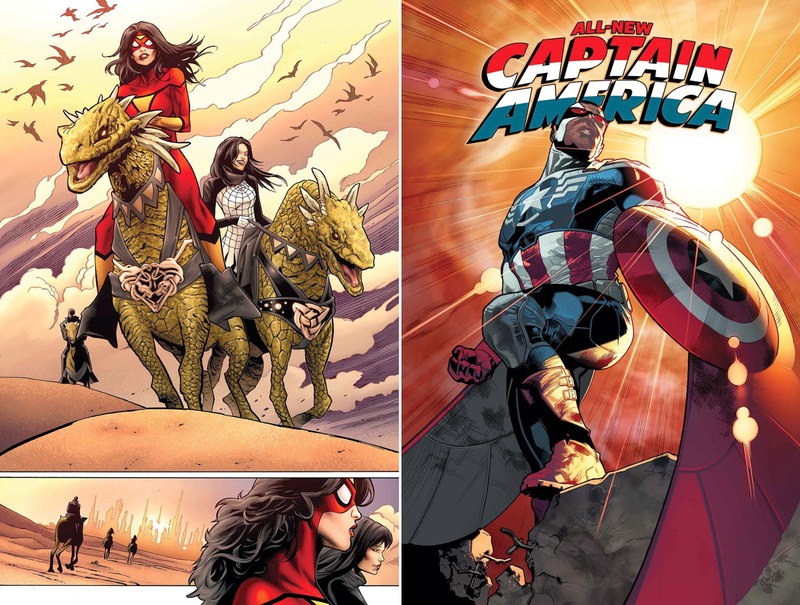 Jessica Drew has been an agent of S.H.I.E.L.D., and agent of S.W.O.R.D., an Avenger and so much more. But nothing could prepare her for the multidimensional insanity that is Spider-Verse! NEW WARRIORS #12 Series finale! It's been a hard road for the New Warriors, and after fighting the Evolutionaries, and saving the planet once or twice, things reach their shocking conclusion! After months of battling, the New Warriors finally find some measure of peace, but will it last? (W) Christopher Yost (A) Marcus To $3.99. FANTASTIC FOUR #13 The rebuilding of the FF starts here, with the return of the blue uniforms! Can The Thing and Sandman escape from super villain prison? Camp Hammond attacked and the Future Foundation kids kidnapped...by Thor? (W) James Robinson (A) Leonard Kirk $3.99. SPIDER-MAN 2099 #6 Spider-Verse Tie-In! Picking up where Amazing Spider-Man #10 ends, Miguel O'Hara is finally back in the year 2099! But no time for nostalgia! Spider-Man 2099, Lady Spider, and the six-armed Spider-Man are on the run for their lives from the dangerously ravenous Inheritors! (W) Peter David (A) William Sliney (A), Francesco Mattina (C), $3.99. What do you think? For the full list of Marvel Comics November 2014 solicitations, click the jump. I saw that cover yesterday. 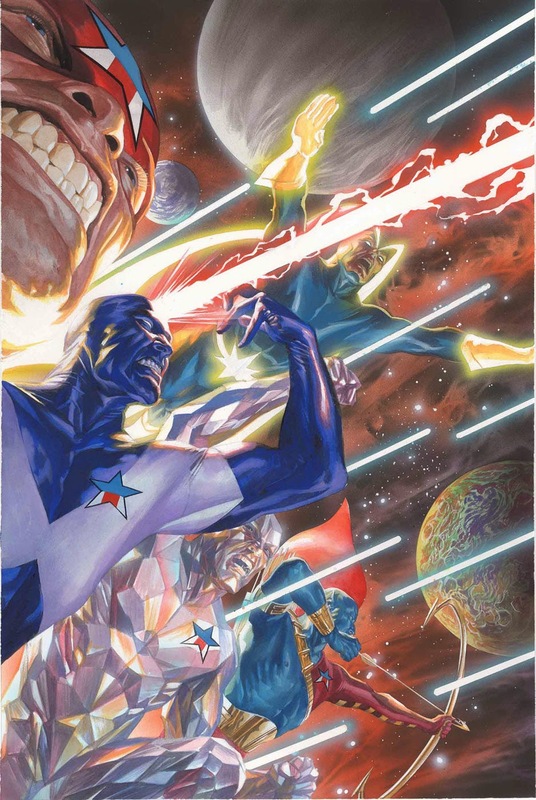 Holy cow, could it be possible that I like Alex Ross even more now? I think it is! Ha! Have you seen the posts comparing her pose to Niki Minaj? That cracks me up. He's a wonderful artist, but all I keep thinking looking at that cover is that she's got to have a spinal injury. Times like this- I miss dating strippers. 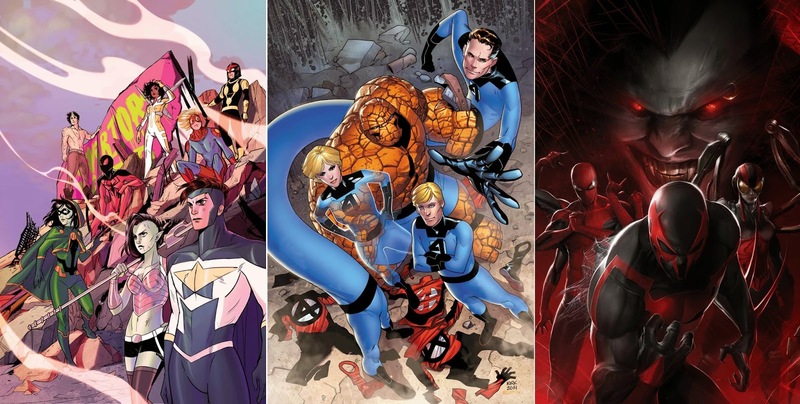 Im just stoked that the Ff are back in their blue costumes! Thanks folks! Random, I think Alex Ross love always grows interest. Like real money or cheese that's been out of the fridge too long. Wait that's not money is it? Karl - me too - plus I'll be glad to get past Original Sin. In every Marvel book I touch the tie-ins just are some of the worst I've read. FF included. On to non-tie in free stories (if they still exist)! From your mouth to the editor's souls. So much good stuff coming up!!! It's really a good time to be a Marvel fan, I gotta admit. I have not been so into new comics in YEARS! Same King - New Warriors, Deathlok, Spider-Woman, Storm, Guardians 3000, it is about time the House of Ideas dusted off these guys!